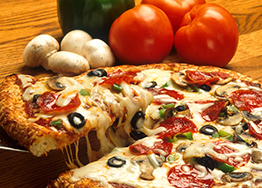 Authentic Italian pizza with the absolute freshest ingredients. Guaranteed to make your mouth water and your appetite satisfied! We've got the best in traditional Italian fare, including veal, pasta, seafood & more! With so many subs to choose from you'll find it hard to decide and all our sandwiches are served on a fresh hoagie bun. Sweet and succulent, our desserts will make you melt with delight. We are delighted to have you!Italian food at it's finest. At Ciao Pizza Italian Restaurant the aroma of fresh baked bread competes with that of lasagna in the oven and the garlic and oregano as pizzas turn a golden brown and spaghetti sauce simmers on the stove. What you'll find at Ciao Pizza is authenticity. Real Italian cuisine prepared in a way to honor the traditional entrés of the old country yet complimented with the nuances of American tastes. Just enjoyed your lunch at your restaurant. Wow! What a great Stromboli that was! Can't wait to come back and try something else! Wonderful dining experience! Thanks so much for putting up with our hungry group. Our homemade dough and the freshest ingredients go into making our amazing pizza, calzone and stromboli. Delicious entres crafted in our kitchen and baked to perfection before being served to our guests. Layer upon layer of delicousness, our homemade lasagna is prepared with seasoned beef and cheeses then baked to perfection. Delicious doesn't begin to describe the sensation of our desserts as they melt in your mouth!